In today’s digital photography world it’s possible to feel like the odd man out when we want to keep a natural feel of color to a scene. Keep that sense of being in a scene that really existed by standing in it and thinking it does exist and it isn’t fantasy. Maybe it’s just being old fashioned or sticking to the roots of what inspired us to begin shooting landscape photography. Maybe it was the books we chose to purchase it we were in inspired before the internet craze? Facebook, Flickr or the internet wasn’t the way people found 90% of their inspiration back then as they do nowadays. There has been trends in the cycle of photography some strange and some just evolution. Back in the 80’s and 90’s landscape photographers used something called a tobacco graduated filter, it was a fad that died just like disco. Today we have “The Magenta Cast” and the “Glow Filter” (gaussian blur / Orton Effect), shoot I’m embarrassed to say I have a few of those images!! Maybe that will be like saying, “I used to wear platforms with live fish in them” ? 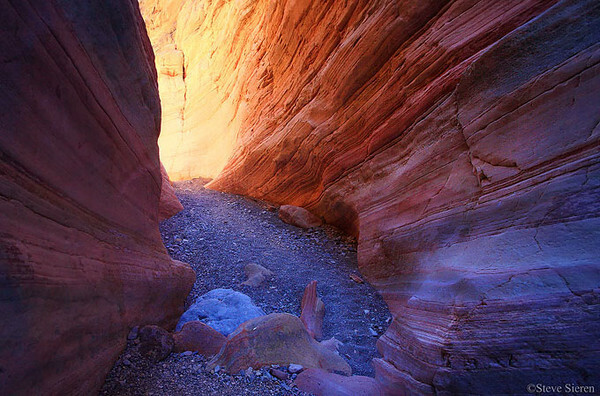 Has anyone noticed a change in color of the canyons of the Southwest or am I seeing things? 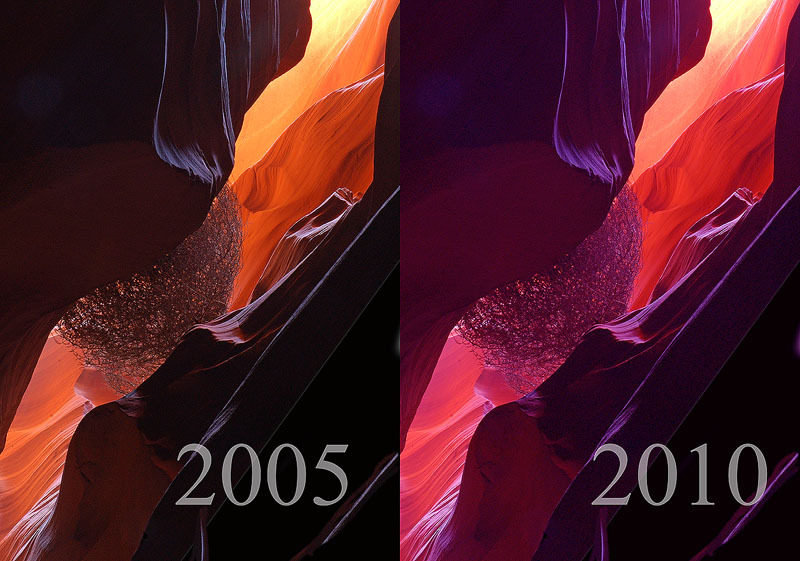 I last visited Antelope Canyon in 2005 and noticed a lack of magenta casts in the photograph during that time period and now it seems that canyon has more of magenta cast in it from most photographs shared on the net from Upper Antelope. Am I out of my mind or this is trend of adding a magenta cast right now? We have to use photoshop as a tool 99% of the time to make our adjustments but there is a certain amount of discretion that highly varies between photographers. It should vary, we are all different. Many of the newer photographers not knowing how to use it well enough to express their imagination to it’s fullest potential feel limited without the knowledge of how to use it. Others overdue and that’s their intent, either way you can learn to connect with the way you would like to present your artwork or photographs. It just takes a little bit of time and if you’re concerned about color management consider backing off on the magenta a little. This entry was posted on February 10, 2012 at 10:53 am and is filed under Uncategorized. You can follow any responses to this entry through the RSS 2.0 feed. You can leave a response, or trackback from your own site. Back in the days of film manufactures and photographers were fanatic about accurate color rendition, seems like that all went out the window with digital. I haven’t been shooting long enough to notice these trends but certainly believe it. Great observation. It’s hard to generalize, but the final use of the image has a lot to do with it. If you’re documenting landscape photography for the purpose of showing other what’s there, then a very modest use of photoshop is called for, but if you’re making images that are striking to the eye and are just going to be a piece of art, I don’t think indiscriminate use of PS would be frowned upon. At one point people carried beepers, now almost everyone has a smart phone, evolution is a natural thing. Freddy, I guess you could say there is plenty of work in between documentary and an advertisement for a super hero movie. 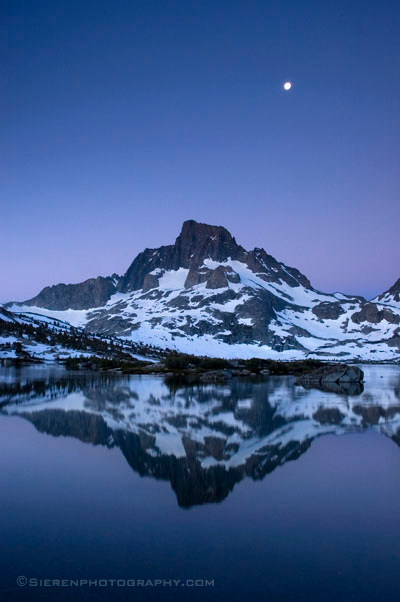 Landscape photography from the greats are neither documentary or have they look like they were spit out of a machine. Your own work has a documentary feel but it is very artistic, yet it doesn’t look like it was spit of a machine or used as a video game set. In the future maybe scenes in video games will catch up to an even more realistic feel, they have come a long way from the 90’s. A photograph can still be surreal but still have a sense of realness to it. In the 70’s, I had formal photography training to gain my bachelor’s degree. For all 4 years we had to work the zone system in B&W and everything always had to be spot on. My professor always held that the image had to speak or provoke a feeling and that color was not going to add to its value. I always maintained that some images were certainly enhanced by color and I always argued the point. Then came digital photography and everyone started over saturating and over sharpening their images. And now that has scaled back to open doors to HDR and surrealism. Of course tomorrow will open another door, maybe back to the zone system or minimalism. I guess it all boils down to do what you like or what sells. There is no right answer. I applaud everyone’s success! I like the natural style of photography – I have not Photoshop and have never tried this (!) – I adjust or crop some of my photos a little before posting them – using Picasa…. Anyway – your photos are so excellent, Steve, I love them! Now we have ICC profiles, digital workflows and those things, but who is using them properly? The “normal” user is confused and tries it best and lacks in it, then he tries to make it better with Photoshop, but what he really does is worsen the picture. So, why is this so? Normaly you have to take a lot of equipment to profile your cam at the location using tools to “measure” the light which is used. This is only done at professional shootings. But this would be the right choice to get to correct color reproduction. Then use a profiled monitor in a controled lighting enviroment, only then you can play with photoshop correctly, and last but not least, the viewer it self has to make sure that his browser (if published on the web) and his monitor is profiled as well and is able to use the profiles provided.